On Sunday December 4 Las Vegas' popular female trio Dangerous Curves performed @ Sterling's Upstairs @ Vitello's. Lisa Smith, Karen Michaels & Margaret Menzies, who comprise Dangerous Curves sang solo and together in a 75 minute varied set that just about blew their audience away. All three are distinctly different beauties in talent, personality and looks, and when they come together, what voices and what beautiful harmony! Not that easy to find nowadays amongst vocalists who strive to overdo style, and scream and screech to grab instant recognition. These gals can really sing and harmonize, and indeed they did with fabulous musical director Dan Ellis at the piano throughout. 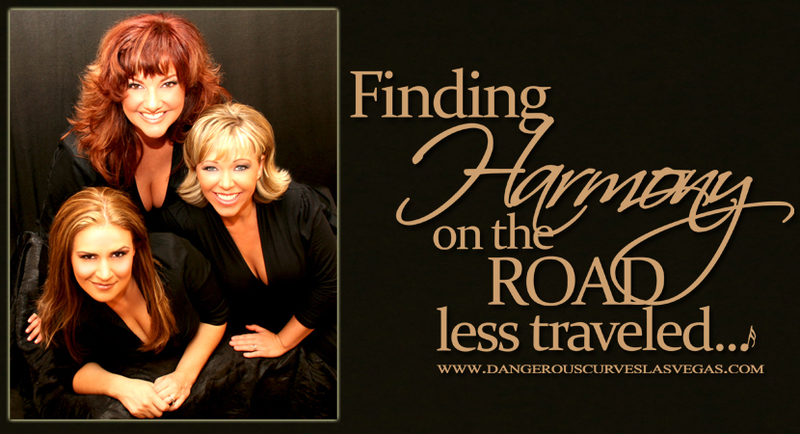 Using the title Finding Harmony on the Road Less Travelled the gals incorporated traditional and newer style pop, jazz, rock and Broadway. Highlights of the evening included: their grab'em opener "Sing", Hendricks' and Ross' eclectically jazzy "Cloudburst", Smith's lovely interp of "Someone to Watch Over Me", Michaels' great rendition of "Faithless Love", Menzies' intro to a terrific Judy Garland medley from all three, including: "You Made Me Love You", "Rockabye Your Baby", Charlie Chaplin's gorgeous "Smile", "The Man That Got Away", the rarely heard "Mr. Monotony" and of course "Over the Rainbow". For Broadway stalwarts like myself, we were treated to a Stephen Sondheim medley that blended: "Anyone Can Whistle", "Being Alive", "No One Is Alone" and "Not While I'm Around". Menzies talked about how much Garland has influenced most female singers and how Sondheim's lyrics really interpret the character an actress is playing. The gals payed tribute to their friendship with "Moon River", did a cute "Ain't Nobody Here But Us Chickens" and put out the idea to everyone of follow your dreams with "Sing Your Own Song". They closed with "I'm A Woman" and as encore did a splashing arrangement of their newly recorded "I'll Be Home for Christmas". This was a splendid evening of song and merriment @ Sterling's, perhaps one of the finest of this past season. Michaels, Smith and Menzies all possess great vocal instruments individually, and, I'll say it again, when they put it together, the harmony is sensational, akin to the Lennon or McGuire Sisters, a sound you just do not hear enough of these days. I was over the moon. You will be too, if you purchase their CD Girl Talk! On December 4 Sterling’s Upstairs at Vitello’s brought a little Vegas to Los Angeles in the form of a marvelous “girl group” called Dangerous Curves. These women are totally professional and are obviously skilled and experienced performers. The trio is made up of Lisa Smith (soprano). Margaret Menzies (mezzo), and Karen Michaels. Their voices blend together beautifully and one couldn’t help but be brought back to an earlier time when groups, male and female, were at the top of their game. They were reminiscent of the Andrews sisters but with a more modern sensibility. Took me back to my favorite groups of the '50s and '60s. Although they blend together seamlessly, individually they couldn’t be more different. Lisa Smith is a jazz singer who, when she doesn’t perform with the group, appears in a tribute to Frank Sinatra. She is totally at ease in this lounge situation. Margaret Menzies is the group’s self-proclaimed “Broadway Goddess.” She is is from Connecticut so she brings with her an Eastern energy that includes all things Broadway as well. In Vegas, she acts as a vocal coach and musical director to many groups in town, both amateur and professional. She also finds time to do an occasional show as well as doing improv. Karen Michaels is the zaftig firebrand of the group. She can really belt out a song. She spends her time doing private functions, corporate parties, weddings, etc. and is working on a solo act with her husband. Their program consisted of solos as well as group numbers. I really enjoyed most all the songs but the highlights were the Sondheim medley, as well as “Someone to Watch Over Me,” “Moon River,” and the hilarious “Ain’t Nobody Here But Us Chickens.” Many of their songs had a feminist slant exemplified in “I’m a Woman” and “Natural Woman.” They have released one album, Girl Talk, and are working on a Christmas album. I look forward to seeing and hearing this group again. They appeared at Sterling’s Upstairs at Vitello’s on Dec. 4.